I found a section of hardwood forest at Primland that was carpeted with Wild Sasparilla! The plants were already past flowering in early June, but the flower stalks were still present below the leaves, and seeds were starting to form on them. See the gallery above. In early spring, before the leaf canopy closes, the leaves of sasparilla sprout from underground stems (rhizomes) that criss-cross around the forest floor. The leaves are pinnately compound, with 3, 5 or 7 leaflets. Each leaflet is finely toothed. Wild Sasparilla flowers appear in May and June; typically they occur in 3 globe-like clusters, all branching from the same stem. The flowers soon give way to purple-black, somewhat sweet berries. The overall height of the plant is 1 to 2 ft. tall. 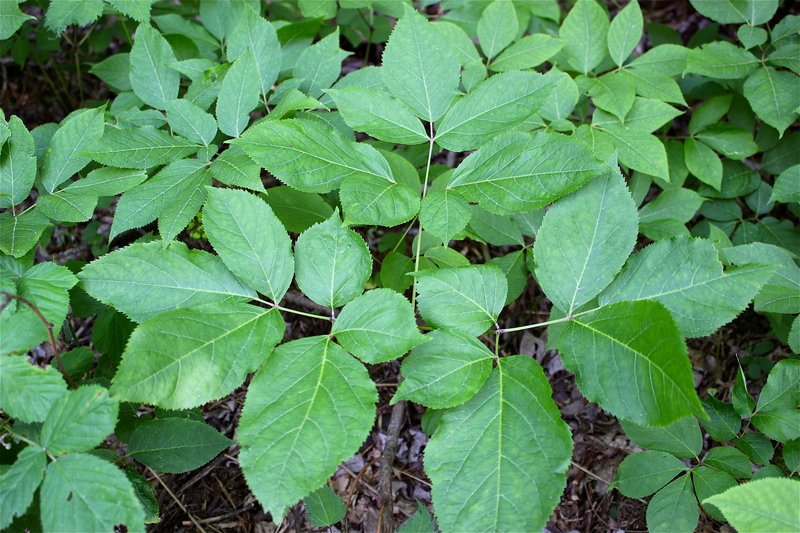 Wild Sasparilla is a member of the Ginseng family (Araliaceae); it grows widely throughout the northern and eastern parts of the U.S. In more northern areas, this plant is preferred browse for caribou and moose; Grizzly Bears like the sweet berries too! In our neck of the woods, the plant is browsed by white-tailed deer and the berries are eaten by black bears, grouse, and songbirds. Seeds are distributed by these and other animals. And yes, you’re right, the roots of this plant have been used to make root beer and other beverages! Other uses include medicinal treatments for various skin disorders. I love the name sasparilla!